Call 252-379-1899 to schedule your first appointment. Choose Miracle-Ear® when you're interested in obtaining hearing aids in Greenville, NC. As an independently owned and operated center, we're proud to employ experienced hearing care specialists. Whether you want a discreet hearing aid or one that offers high-definition sound, we have a variety of hearing aids to choose from. Having more than 1300 locations nationwide, we take pride in being America's most recognized brand of hearing aids. As we have more than 70 years of experience, you can trust that you'll receive excellent care when working with us. Your experience as our customer will begin with a free hearing test. * Our local hearing aid center proudly provides an array of innovative hearing solutions. Among our line of high-quality hearing solutions is the new GENIUS™ Technology, which allows you to hear front and center without any unwanted noise and feedback. All of our units are augmented with industry-leading technology. Discover and experience the Miracle-Ear advantage. We'll offer you a 30-day trial, risk-free* so you have the chance to test drive the hearing aid. No matter the extent of your hearing, we'll work hard to address your unique situation. Our talented hearing care specialists can also provide reliable hearing aid repairs. We're conveniently located in Greenville, and we can serve customers in Coffeyville and Dearing, so call or come by our hearing aid center today. Judy is an extremely knowledgeable and diligent Patient Care Coordinator. She has been with Miracle-Ear since 2001, and has been the recipient of numerous awards for service and performance excellence. 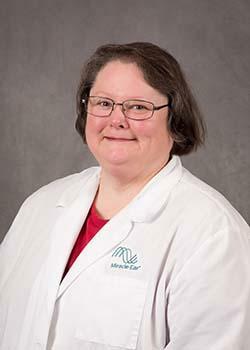 She has received the highest honor awarded Patient Care Coordinator of the Year, on multiple occasions. Judy brings the highest level of patient care possible. She knows all of her hundreds of patients by name, and greets all of them with genuine warmth when they arrive in her office. In addition, Judy ensures that the patient's appointment starts right on time! Judy feels, "A patient deserves the very best that Miracle-Ear can offer. I have dedicated myself to assisting in the hearing health of all of my patients. It is very gratifying to see the look of joy on patients' faces when they leave hearing better. I am providing something of high value to our community with my service." When not working, Judy enjoys spending time with her family and playing with her new dog. * If you are not completely satisfied, the aids may be returned for a full refund within 30 days of the completion of fitting, in satisfactory condition. Fitting fees may apply. See store for details.